CHICAGO — If Kirk Ferentz and his agent Neil Cornrich ever have a fallout, the Iowa coach might want to look into Matt Millen. 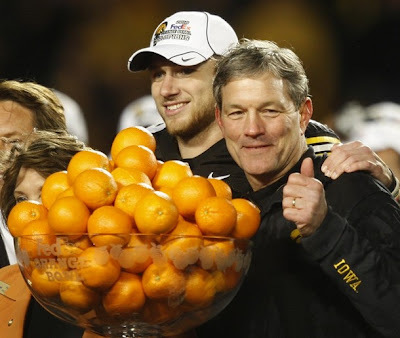 Millen loves Ferentz. He also loves quarterback James Vandenberg. Millen, a former all-pro linebacker with the Oakland Raiders, loves Iowa middle linebacker James Morris. Millen, former GM for the Detroit Lions, loves Iowa’s offensive tackles Riley Reiff and Markus Zusevics. Millen called the 2009 Ohio State-Iowa game, the one substantial start in Vandenberg’s career. He loved Vandenberg during the telecast and loved him again Thursday. Oh, and yes, he noticed the camera loved Vandenberg’s mom, Ann. OK, but really, Vandenberg the quarterback stepped in for injured starter Ricky Stanzi with the Big Ten title and a trip to the Rose Bowl on the line and pushed the Buckeyes before falling, 27-24, in overtime.